If this card is Normal Summoned: Place 1 Spell Counter on it (max. 1). Once per turn, if a Spellcaster-Type monster(s) on the field would be destroyed, you can remove 1 Spell Counter from your side of the field for each of those monsters instead. This monster has one Spell Counter in the center of his shield, one on his dagger and five on his armor, which equals a total of seven visible Counters. When applying the effect of "Defender, the Magical Knight", you do not choose how many Spell Counters to remove - you must remove a number of Spell Counters equal to the number of Spellcaster-Type monsters which will be destroyed. : When multiple Spellcaster-Type monsters are to be destroyed simultaneously, can you choose the number of Spell Counters to be removed from "Defender, the Magical Knight"? Example: You control "Defender, the Magical Knight" and two other face-up Spellcaster-Type monsters. When your opponent activates "Lightning Vortex", if you want to use the effect of "Defender, the Magical Knight", then you must remove three Spell Counters. (You cannot remove two Spell Counters to prevent the destruction of only two Spellcaster-Type monsters.) If you do not have three Spell Counters, then you cannot apply the effect of "Defender, the Magical Knight". When a Spellcaster-Type monster is destroyed by battle, if you apply the effect of "Defender, the Magical Knight", then you apply the effect and select the Spell Counter at Damage Calculation. The chosen Spell Counter is removed from the field at the end of the Damage Step, when the monster would be sent from the field to the Graveyard. : When a Spellcaster-Type monster is destroyed by battle, at what time do you apply the effect of "Defender, the Magical Knight"? 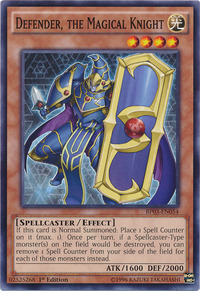 "Defender, the Magical Knight" is a Spellcaster-Type monster, so if "Defender, the Magical Knight" would be destroyed, you can apply its effect and instead remove a Spell Counter. : When "Defender, the Magical Knight" is destroyed, can you instead remove a Spell Counter?